This is the soup that I cooked at the Glenroe Ladies’ Club demonstration – it is something that I make regularly as it has a great flavour, doesn’t take long and is really good for freezing. The smoked paprika is fabulous with it, giving a real depth to the soup. Perfect for sipping out of a large mug while you warm your hands, especially on a miserable wet day like today. 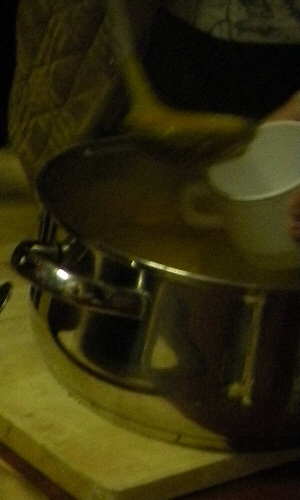 Heat the butter and olive oil in a large saucepan. Add the onion, garlic, salt and black pepper and cook over a gentle heat for about 5 minutes until soft. Sprinkle the smoked paprika over the mixture and stir together for a minute until fragrant. Add the chopped squash, sweet potato, thyme and hot stock. Bring to a simmer, cover and cook for 15-20 minutes or until the vegetables are tender. Using an immersion blender (or a liquidiser) puree the soup. Return to the pot, heat through and taste for seasoning. Serve topped with a dollop of yoghurt. I have been making butternut squash soup for years but never even thought to put smoked paprika in it- what a fabulous idea! I live in the USA, in Massachusetts, and butternut squash is a huge staple here in the autumn and winter. I use all the same ingredients and flavors that you use, and I have to laugh because a few years ago, I started putting sweet potato in to thicken the soup without cream. I figured that white potato works so well to thicken chowders, why not sweet potato here? I thought I created the idea, but I see others have “discovered” it, too! Anyway, I will try the smoked paprika next. Keep up the fabulous recipes!!!!! Great minds think alike! It is a great combination, isn’t it? You should definitely try the smoked paprika with your squash and sweet potato. It gives a lovely deep richness to the soup. I’ve made the soup twice in 1 week…yummy and easy, even works with my own little missy in hand! Glad to hear it, Carina. I find that it’s the chopping that’s impossible with LM in arms, the rest of the prep is managable, although not very easy! Really like this soup. It’s a great winter warmer and good for several days for the two of us. You’re right, Berenice. It’s a great one to reheat the next day, especially as the smoked paprika gets a chance to properly acquaint itself with the other ingredients that way. I find that leaving the butternut and sweet potato in a pot of semi-boiling (as hot as you can get it without it bubbling like mad!) water for about 15 minutes softens up enough to cut and peel them really easily. But leave them in for too long and they become too soft and mushy! That’s a good tip, Sarah. I’ve just done battle with a butternut squash and I must try some easier way of peeling it. I love cumin and squash together. Good plan for the next pot!